Few cities can claim a neighbor as spectacular as we can: The Broadmoor. This legendary resort is founded in history (they opened their doors in 1918) yet modern in every amenity - it's no surprise that it is the longest-running consecutive winner of Forbes' five star and AAA's five diamonds designations. It's a special destination worthy of any occasion; even if an overnight stay is not on your radar or in-budget, the activities and dining that the Broadmoor offers still should be! Here are a few of our favorite ways to enjoy this local gem. Enjoy a romantic walk with a loved one or watching your kids chase the ducks. The Broadmoor's lake, central to the resort, is beautiful any time of day - a perfect spot for family or event photos. Complete your experience with a drink at The Hotel Bar, which overlooks the beautiful setting. It's chilly in winter, but the Christmas decorations and lights are a treat! Bonus: it's free! There are an extensive number of dining options at the Broadmoor, but The Golden Bee is our casual favorite. This 19th-century British Pub was brought to The Broadmoor panel by panel from the UK - it's truly authentic! Their fish and chips are delicious, the ragtime piano player keeps things lively in the evenings, and the upstairs patio offers an al-fresco option if that's more your style. You'll even come away with a buzzy souvenir. More details here. 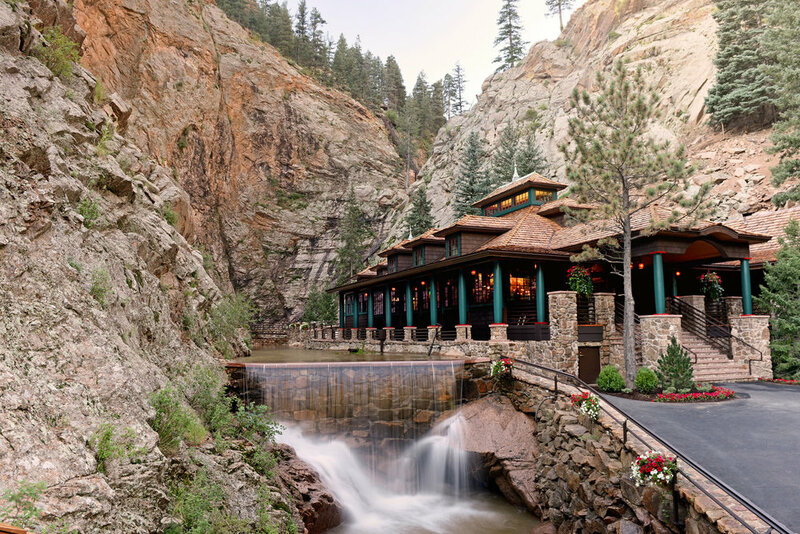 Seven cascading waterfalls highlight Cheyenne Canyon just a few minutes away from The Broadmoor. Climb 224 adjacent stairs to the top of the falls (or take the elevator!) for a spectacular view and access to hiking trails. At the base of the falls, Restaurant 1858 (named for the gold rush era) is a special dining experience, offering Colorado fare. To get there: a shuttle picks up just outside the Golden Bee. Tickets are $9 for children, $14.50 for adults. More details here. Keep everyone in your family entertained with this fun-filled destination. This on-property restaurant features a family-friendly menu, as well as activities like bowling lanes, a shuffleboard table, a pool table, foosball and game monitors. There's something for everyone to enjoy! More details here. The Broadmoor said it best: "Located in the secluded South Cheyenne Canyon, The Broadmoor Soaring Adventure consists of 10 zip lines (divided between two courses) that range in distance from 300 feet to 1,800 feet as well as moderate hiking, rope bridges, and a controlled 180-foot rappel that offers stunning views of the waterfalls and the canyon below." Sign us up! More details here. The Broadmoor offers so much more than we could possibly list here - from fly fishing and wilderness experiences, to their world-renowned spa and dining options. Be sure to check out their full offerings here.